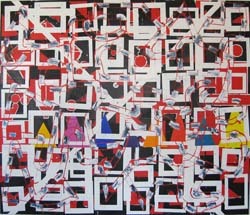 Will Fowler’s plethoric patterned canvases are mesmerising in their intensity. Drawing association to 20th c masters such as Dubuffet, Pollock, and Miro, Fowler approaches painting as purist pursuit, recycling and quoting from his own lexicon of gesture, mark-making, and iconography. Often taking years to complete, Fowler’s paintings refuse to resolve as totalities, but rather dazzle with their cacophonous overabundance of energy and contradiction. 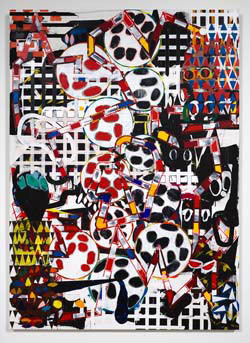 In TBD, Fowler’s enmeshed motifs compile with vivacious tension, each dot, square, and triangle vying for individual recognition; the solidity of his geometry further unsettled with casual intuitiveness of painterly gesture.